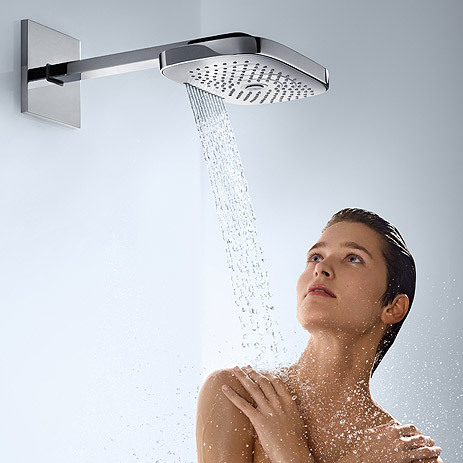 hansgrohe overhead showers are an incomparable source of refreshment and relaxation. They envelop your body in dream-like shower rain, gently douse you in water, massage, and thoroughly rinse out shampoo. 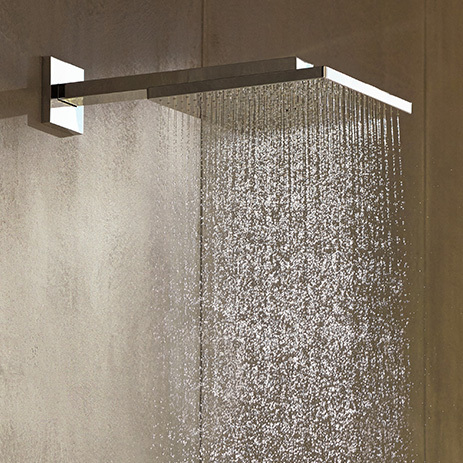 Rain showers from hansgrohe are also a delight to look at, creating real architectural highlights in your bathroom. Experience exceptionally versatile showering fun with Select overhead showers: with these, you simply select different jet types and showers at the touch of a button. Whether you opt for a round or square design, 1-jet, 2-jet or 3-jet, hansgrohe overhead showers will transform any shower into a place of personalised water indulgence, offering a variety of shapes, sizes and jet types. You can find them all here – along with PuraVida overhead showers, water-saving models such as Crometta and the angle-adjustable Raindance Rainfall Stream overhead shower. Not forgetting hansgrohe side showers, for an all-round sensational experience. These products add a whole new dimension to showering. Available in sizes up to 580 mm, the Rainmaker Select offers a truly captivating experience in your new rain shower. The highlight is its precise, laser-cut glass spray disc - with up to 244 spray nozzles. The glass, which features a white background, will integrate seamlessly into your bathroom environment. The slender chrome frame makes the XXL overhead shower look elegant and light. Operate it at the touch of a button - which is situated on the recommended thermostatic mixer. This is what the Raindance Select E 300 offers, for example, with its jets - Rain (invigorating), RainAir (soothing) and gush spray RainStream (enthralling). The Select button, which can be reached from below, makes it really easy for you to switch between jet types. Harmonious solutions for customised shower scenarios. The quadratic design of the Raindance E 300 is compatible with lots of bathroom styles, and can be perfectly combined with modern hansgrohe mixers. This XXL rain shower truly excels, thanks to the ergonomic layout of its individual jets - offering a completely new showering sensation. It can be installed on the wall (300x300 mm) or flush with the ceiling (400x400 mm). Also flush with the ceiling is the Raindance Rainmaker rain shower (with or without lighting). Models such as Croma and Croma Select are user-friendly and offer you lavish showering experience at an affordable price. Their spray discs (Ø 180 mm) come in two shapes (round or square) and in two surface finishes (fully chrome-plated or white/chrome). 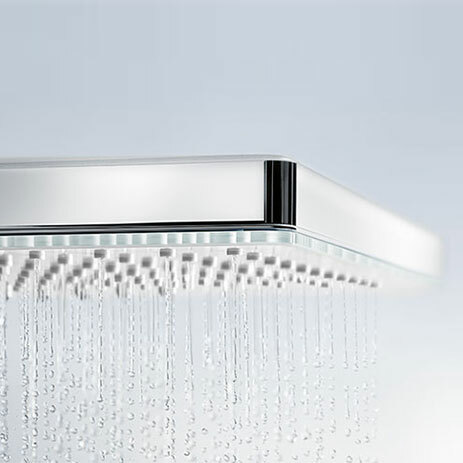 The round Croma (Ø 280 mm) pampers you with full-bodied RainAir shower rain. Here, the large spray disc is made of high-quality, fully chrome-plated metal. Innovative features such as AirPower and XXL Performance. Lots of models are available in EcoSmart versions with water consumption reduced to 9 l/min. They are easy to clean in just a few simple steps. For example, the easy-to-remove spray discs on the Raindance, Croma and Croma Select are easy to clean and can even be put in the dishwasher. Practical feature: Anti-limescale solution with QuickClean.